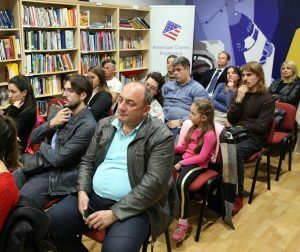 As part of Global Entrepreneurship Week, the third thematic gathering of young entrepreneurs from the Youth Business Program with the support of the US Embassy in Podgorica, was held on 15 November at the topic ‘Competitiveness and protection of intellectual property’. 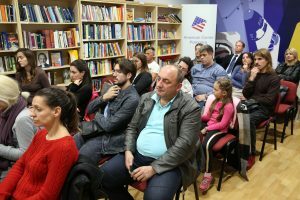 The gathering was led by Ana Rutović and Mladen Koprivica from the Institute for Intellectual Property, at the premises of the American Corner. 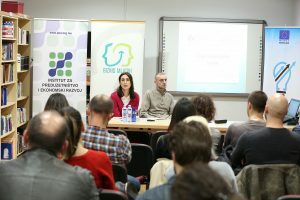 At the beginning, all the attendees were addressed and welcomed by Dragana Radevic, director of the Institute for Entrepreneurship and Economic Development. Entrepreneurs had the opportunity to learn how to protect the idea, why and how to protect the right to design, brand, how to patent the product, how much the procedure costs and how demanding the procedures are and how copying could be prevented. This was an opportunity for young entrepreneurs through the practices of first-hand information on how to protect the logo and why it is important to protect intellectual property against copying. Also, through practical examples, the young entrepreneurs were able to learn how it was possible to get a patent and what steps an examiner of patents took in a single procedure, after the processing of the request from the legal or natural entity. The topic had a great interest among participants and encouraged them. Thematic gathering was organized in the framework of the Program of mentoring and training for young entrepreneurs – Youth Business, in cooperation with the Union of Young Entrepreneurs of Montenegro and the Institute for the Protection of Intellectual Property Rights, with financial support from the US Agency for International Development (USAID).